Serve up some smiles with Strawberry 'n Cream Minis. Our Strawberry 'n Cream Minis are topped with fresh strawberry slices as a tasty extra flourish. Prepare using 1 pkg. (0.3 oz.) 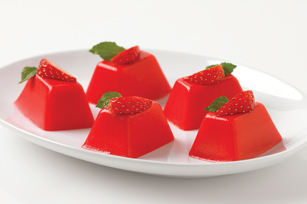 JELL-O Strawberry Flavor Sugar Free Gelatin. Refrigerate gelatin mixture in 9x5-inch loaf pan instead of in the ice cube trays. Unmold gelatin mixture, then cut into 16 rectangles. Serve topped with strawberries. Makes 16 servings.